Unfortunately, chivalry seems to be going out of style. Truly, so are good manners and common courtesy. The gentleman is a dying breed. It is tragically difficult to find a man who is patient, considerate, and kind. They are so rare, in fact, that many women will mistake a man’s good manners for a sexual advance. 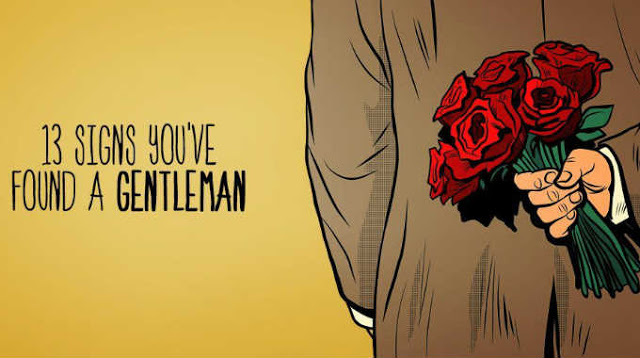 SO – HOW DO YOU IDENTIFY A REAL GENTLEMAN? 01. HE TELLS THE TRUTH. A gentleman is honest. You can trust him to be straight with you. Even when the truth does not put him in a flattering light, his sense of integrity is greater than his ego. 02. HE DOES NOT EAT UNTIL EVERYONE HAS BEEN SERVED. He will not act selfishly or impulsively. He is considerate. He is willing to wait patiently to ensure others are comfortable. 03. HE STANDS UP FOR OTHERS. A true gentleman is not only kind, but brave. When he sees someone being abused – physically or verbally – he will confront the offender. He acts as a guardian to the welfare of others. 04. HE KEEPS HIS SEXUAL ADVENTURES BETWEEN HIMSELF AND HIS LADY. He would never humiliate her by sharing their private moments with his friends. He doesn’t need to. He respects himself, and he respects the woman he chooses to be intimate with. 05. HE KEEPS HIS WORD. He does not have to tell you that he is a man of his word. He shows you every day. If a gentleman promises to do something, you can confidently plan your day around it. When you are speaking to him, he is listening. He isn’t spacing out or checking his phone. He isn’t texting. He is certainly not tweeting. 07. HE IS KIND TO EVERYONE. Even if someone treats him rudely, he does not retaliate. A true gentleman will always choose the high road. He has nothing to gain by lowering his own behavioral standards. 08. HE WALKS BY THE STREET WHEN HE IS WALKING WITH YOU. He feels more comfortable if his body is between yours and the road. This is a small gesture that often goes unnoticed. He is protective without being overbearing. 09. HE IS ON TIME. He respects your time. He is mature enough to stick to a schedule. He gets no pleasure out of making you wait around for him. He is quick to identify the needs of others, and he strives to meet them immediately. He puts your comfort before his own. 11. HE REACHES FOR THE CHECK. He offers to pay. If you insist on splitting it, he listens and respects your wishes. He does not make a big show of insisting to foot the bill. 12. HE HOLDS THE DOOR. He is patient and attentive. He has good manners that he puts into practice daily. 13. HE SAYS “PLEASE” AND “THANK YOU”. He excuses himself when he’s made a mistake. His politeness knows no bounds. “Chivalry: It’s the little boy that kisses my hand, the young man who holds the door open for me, and the old man who tips his hat to me. None of it is a reflection of me, but a reflection of them,” wroteDonna Lynn Hope. Do not buy into the myth that chivalry and feminism can not coexist. Being a gentleman is about living up to one’s own high standards. If you find a true gentleman in your life, strive to keep him. He is a rarity.